Mr Flay appeared to clutter up the doorway as he stood revealed, his arms folded, surveying the smaller man before him in an expressionless way. 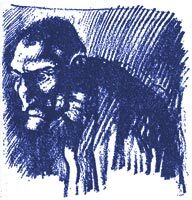 It did not look as though such a bony face as his could give normal utterance, but rather that instead of sounds, something more brittle, more ancient, something dryer would emerge, something perhaps more in the nature of a splinter or fragment of stone. Nevertheless, the harsh lips parted. ‘It's me,’ he said, and took a step forward into the room, his knee joints cracking as he did so. His passage across the room - in fact his passage through life - was accompanied by these cracking sounds, one per step, which might be likened to the breaking of twigs.